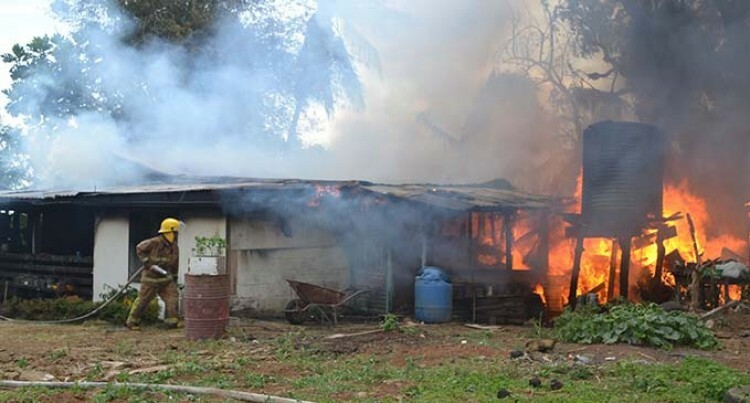 A five-bedroom house in Emily Road, Siberia, outside Labasa Town was razed in a fire yesterday. House owner Anil Maharaj said he was watching television when his daughter-in-law, Nandita Maharaj, yelled out that there was smoke coming from a bedroom. Mrs Maharaj said she was washing dishes in the kitchen with her housegirl when she smelled smoke. “When I went inside my father-in law’s brother’s room, I could see smoke and a little flame,” she said. “I immediately called National Fire Authority and then my housegirl and I tried to douse the fire with buckets of water, but it had spread very fast. “We quickly grabbed my son and checked whether my father-in-law was safe and then went outside. “We could not save anything; everything was destroyed in the fire. “Forunately no one died in the fire,” she said. Seven people lived in the house and four of the family members were at work when the fire happened. Mr Maharaj and family are now living at his daughter’s house which is situated in the same compound. National Fire Authority chief executive officer John O’Connor said they were carrying out an investigation.